When I tested out the recipes for the show I was with my family and a few friends. They really enjoyed them. The idea was to show people that you can prepare your dishes differently. One doesn’t have to stick to the tried and tested ways. For instance, the Xiritsa Xa Tamati dish, I flavoured it with ginger and presented it in a form of a dip. I was not familiar with the blender on set as a result my dip was not as smooth as I would have wanted it to be. The chicken gizzards have also been prepared in a form of kebabs. The judges commented that the gizzards were somewhat bland. The idea was to ensure the flavour comes from the dip. The flavour is there when the gizzards and dip are eaten together. I’m sure the judges were put off by the “not so smooth” dip therefore did not eat them together. What did you guys think of the judges? Aren’t they unashamedly mean? What happened to “constructive criticism”? They didn’t have one good thing to say about any of the dishes I prepared on the show. Get to try the dishes and make your own opinion. See if you agree with the judges or not. After all, the dishes we (food bloggers) present on our blogs are for the homemaker. Therefore, it would be interesting to hear your opinions. Today I’m sharing the starter recipes. Soak 6-8 bamboo skewers in water for at least 30 minutes. Rub all the ingredients on the gizzards and marinate for 10 – 30 minutes or longer. Thread the gizzards onto the bamboo skewers. Cook under a preheated grill for 20 – 30 minutes at 180۫C. Brush with the marinade and turn occasionally until cooked through. Serve with Xiritsa Xa Tamati Dip and some rocket leaves or fresh coriander. In a medium saucepan, heat oil and sauté onion and green pepper. Add tomatoes and the rest of the ingredients and stir occasionally until cooked. Transfer into a blender and puree until smooth. 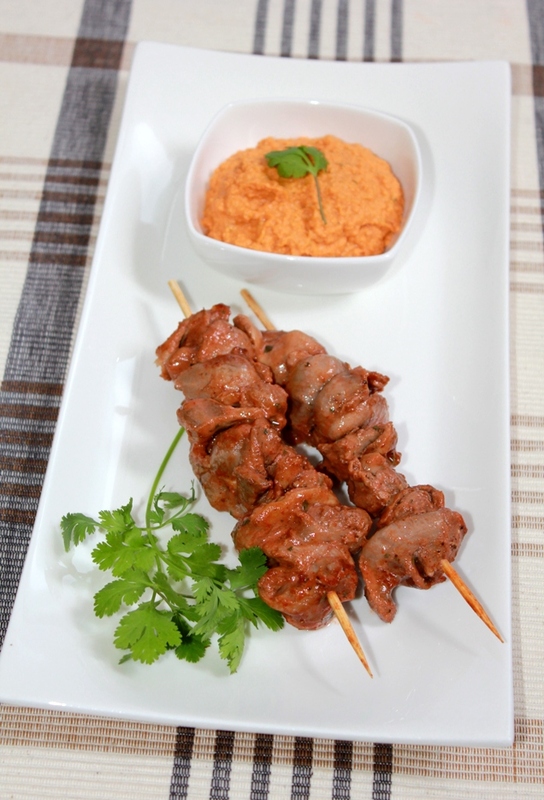 Serve as a dip with Sweet & Sour Gizzard Kebabs.